All Oz Abstract jewelry are 100% hand-made by standard setting artists, using only the finest materials and techniques available in the industry. Oz Abstract Tokyo proudly provides a Life Time Guarantee to all pieces purchased on our Online store, or, Tokyo Headshop. This life time guarantee is valid against all defects in material or craftsmanship. If you experience any problems due to defect in material, or, craftsmanship with any of the jewelry you purchased from Oz Abstract Tokyo, please contact and inform us of the problem, or, defect as soon as possible. You will be asked to send back the defected piece to our Tokyo Headquarters for assessment and repair. Once the process is done we will ship back your repaired piece to an address of your choice. Oz Abstract Tokyo Online Boutique customers are also entitled to take advantage of our wide verity of Post Purchase and Maintenance Services in the case of none valid guarantee due to the reasons mentioned above. Please refer to our Post Purchase and Maintenance Services page for further details. Oz Abstract customers can take advantage of our variety of post purchase & maintenance services. Depending on the item and level of damage charges may apply. Depending on the depth of scratches some may not be able to be removed and polished completely. Depending on the ring type and requested size charges may apply. Re-Sizing the length of chains. Maybe impossible for some chains. Although cutting a chain short is doable for most models, it maybe impossible to extend the length of certain designs. Setting & Re-Setting of stones. Depending on the stone and service type, charges may apply. For any other services you may require, including custom work, please do not hesitate to contact us at any time. For all Post purchase & Maintenance Services shipping fees are the responsibility of the customer. Charges may apply for certain services. None the less, it is our promise to our clientele to always maintain reasonable and affordable rates for these services and whenever possible supply these services free of charge. Post purchase & Maintenance Services apply only for jewelry and accessories purchased at Oz Abstract Online Boutique or Tokyo head store. Each and every order we send out to you is carefully packaged for full protection and safety. 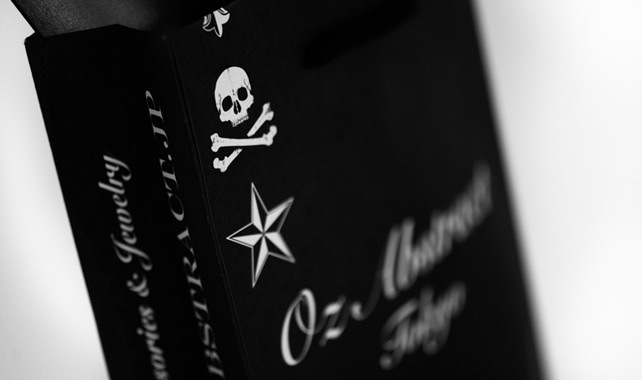 Whether you order a piece for yourself or as a gift to a loved one, receiving a package from Oz Abstract Tokyo is guaranteed to be a pleasure to open. Oz Abstract Tokyo Online Boutique accepts and process orders from any where in Japan. We provide our customers with door-to-door delivery service using KuroNekoYamato Takkyubin, at a flat rate of ¥500. It doesn`t matter where you order from or the size and weight of your order, domestic shipping fees are always the same. All packages are insured for the value of the inclosed order and once shipped usually arrive with in 1 to 2 days. After processing your order, we will contact you via e-mail to personally inform you that your order has sent. We will also forward you the 12 digit tracking number attached to each and every package. Using the tracking number you will be able to follow up on the status of your order as it is making its way to you and contact your local KuroNeko Yamato representatives to schedule a delivery at your convenience. The status of your order will also be updated in your account with us. Feel free to access your account at any time to view the most recent information regarding your orders. If you need further assistance please dont hesitate to contact us directly at any time. We are here to help. Oz Abstract Tokyo Online Boutique accepts and process orders from any country on the planet. We provide our customers with door-to-door delivery service using EMS (Express Mail Services) at an international FLAT rate of ¥1,500 (approx. USD $20). It doesn`t matter where you order from or the size and weight of your order, international shipping fees are always the same. All packages are insured for the value of the inclosed order and usually arrive with in 5 to 7 business days. After processing your order, we will contact you via e-mail to personally inform you that your order has sent. We will also forward you the 13 digit tracking number attached to each and every package. Using the tracking number you will be able to follow up on the status of your order as it is making its way to you and contact your local EMS representatives to schedule a delivery at your convenience. Be advised that importation laws and regulations differ from one country to another. Import taxes and duties may apply when receiving your order. Oz Abstract Co., Ltd. is in no way responsible for handling, negotiating, or covering these costs. Read all terms and conditions on the next page.